From the moment we stepped in, we knew we should have booked somewhere. Yes the location is great but that is where it stops. We arrived at close to midnight and found out that these "appartments" are in fact condominium houses located in 2 big towers which are quite old. That is not really the issue. The issues were several; poor quality of service, dirty apartment with marks on the walls, mould in the bathroom, foot print on a white bathroom floor, cupboards not closing or broken. To top up everything, we arrived at close to midnight and after going through the security gate (these appartments are behind security gates), the lady in charged was called in to take us to the reception then the apartment and it looked like we were bothering her! She took us to level 3 where the reception is and could not be bothered keeping the door opened for us. I would usually won't mind but having been travelling for 4 weeks in Argentina we have quite a few luggages and a little help would have been appreciated. Definitely a place I would not recommend. Spend a little bit more and you will find better places in downtown Santiago (that is what we did the week after when we were back in Santiago. The layout was quite efficient and the location to transportation convenient. Nice area with lively restaurant scene and museum access. The kitchen was ill equipped and did not provide basic necessities. 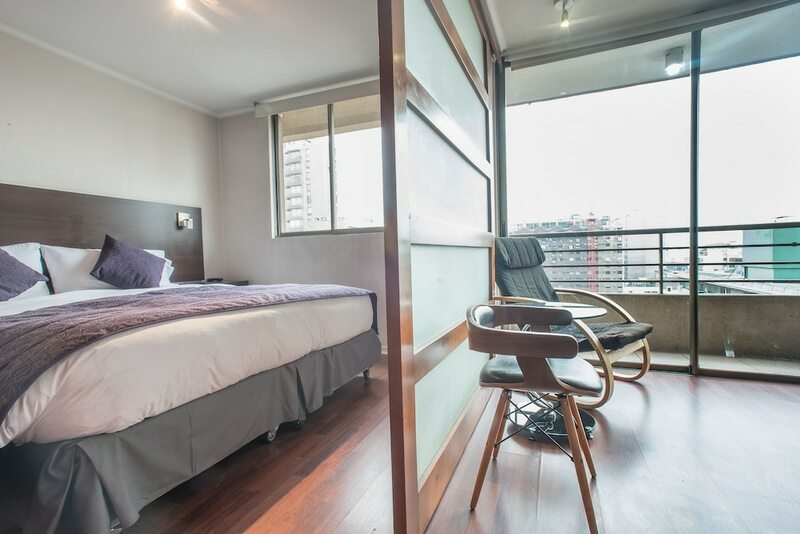 Beautiful suite in the heart of Santiago. If you are on the 15th floor or higher, you will get a spectacular view over the city. Parts of the furnishings were damaged or broken and the kitchen offers only the bare minimum in cooking equipment. We were pleasantly surprised that the staff at the reception speaks English very well, since no one in Santiago seems to speak English at all. Easy to access main tour sites, close to many good restaurants, shopping stores, close to subway stations, hop- on and hop off, taxi, service people on counter can speak English. With family and plan to stay long, this is the best hotel, there is a kitchen, you can cook in your unit. I stayed here for 90 days and i got very good support from Altura manager Jaime, He made sure that all my requirements are fulfilled. friendly reception staff. Great location and nice rooms. I recommend to stay here if you are looking for long stay. very good place to stay in Santiago for the price. Right next to everything especially the supermarket. January is the hottest month and the place has no air-condition but an extra electric fan will do the job. An unpleasant reception, a lack of will to help, an old-fashioned, damaged and unkept housing. Dirty walls, dirty stores. A window can't be close; you can open it even if it is close. The reception don't respect your request. But... a central location. Located in Santiago Center, Altura Suites places you next to Santa Lucia Hill. This 20-room, 3-star apartment building has in-room conveniences like kitchens, sofa beds, and living rooms. Each apartment is individually furnished and features a kitchen and space to spread out with a separate bedroom, a living room, and a dining area. Guests can expect to find free WiFi and 24-inch a TV with satellite channels. The Select Comfort bed provides a full night's sleep and the bathroom offers hair dryers. Other standard amenities include a sofa bed, free local calls, and a safe. At Altura Suites, guests have access to a rooftop terrace, free WiFi in public areas, and laundry facilities. Self parking is offered for USD 15.00 per night. Front-desk staff can assist with tours/tickets and luggage storage. This smoke-free apartment building also has a convenience store. The preferred airport is Santiago (SCL-Arturo Merino Benitez): 9.1 mi/14.6 km. Distances from the property's location to the airport are straight-line distances and may not reflect the actual travel distance. National History Museum: 0.4 mi/0.6 kmDistances from the property's location to the point of interest are straight-line distances and may not reflect the actual travel distance. The front desk is available during limited hours. Driving? This property offers limited parking, along with offsite parking (reservations required). This property's front desk is open daily from 8 AM - 10 PM.